Black sesame is one of my favourite flavours and there are a few dessert recipes that I have been planning to make for ages. One is a sticky laddu that my mother makes and another is an ice cream that we love at The metropolitan Hotel, this black sesame pudding was made a few times but in slightly different ways. You would know what I mean by calling black sesame as a flavour when you eat this. Promise. 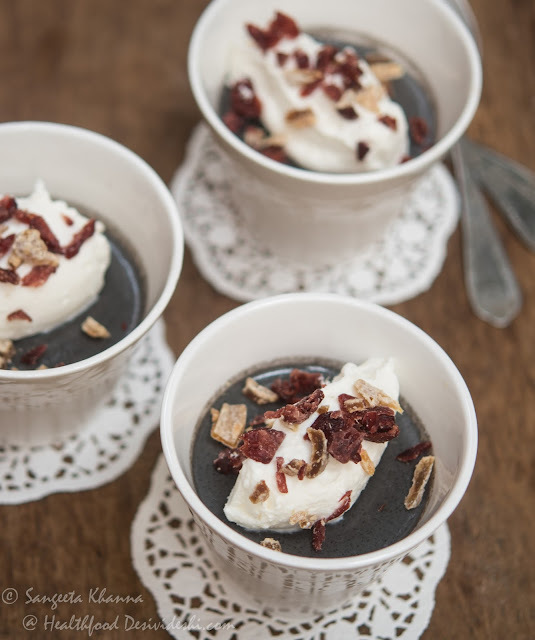 I think I have found my perfect recipe of black sesame pudding and even the perfect way to serve it. The pudding is lightly sweetened, is topped with whipped cream (made from scratch) and a sprinkling of chopped candied cranberries and candied ginger. All winter flavours. Oh yes, I said "home made" heavy cream that whips like a dream, that stays stiff for more than 8 hours at room temperature (26-17 C day time temperature right now in Delhi) and tastes pure and delicious, just like real cream should taste. Did you know the market is replete with non dairy whipping cream loaded with trans fats? Almost all bakers use that cheap whipping cream because dairy based real whipping cream is hard to come by in India. Whipping cream contains 30-35% fat and heavy cream has up to 40% or even more. While whipping cream whips well to be used as a topping or cake frosting, heavy cream sets really well as a frosting and stays as is for longer. More reasons to make heavy cream from scratch at home. I know you would be surprised when I tell you how easy it is to make heavy cream at home and that too from whole milk. The newly launched Premium milk from Mother Dairy makes it even more easy even for beginner cooks. You know how we simmer the milk for a few minutes even if we get pasteurized milk that can be used directly out of its packaging. Yes it is a cultural habit that we don't use and store milk that has not been simmered for a while. This habit of refrigerating milk after simmering for a while can be of help while making whipping cream. Take a look how I do it. The milk is emptied into a stock pot and simmered, then it is refrigerated overnight. We observe that all the fat content accumulates on top that we call as Malai, see how it looks in the top right picture. The same malai can be used to make whipping cream if you take care of measurements. It takes just 5 minutes once you have the refrigerated premium milk. Any dessert malai maar ke is our way. Empty the milk into the stockpot and place on gas stove to heat up. Lower the heat once it reaches boiling point and let it simmer for 5 minutes. Cool down the milk and refrigerate for 6-8 hours. Separate the malai (coagulated cream on top) in a measuring cup along with some thick milk on top, it should be 300 ml total volume so it makes heavy cream of about 46% fat content. If you collect 400 ml from the top layer it will result into whipping cream of 35% fat content. Simple mathematics. Now transfer the malai into the chilled glass bowl and start whipping. In less than 5 minutes you have the perfectly whipped cream that can be used directly or mixed with icing sugar for any purpose. Note that you can refrigerate the premium milk even without heating, the resultant whipping or heavy cream will be as good. I am recommending heated milk as we anyway store the milk this way, so the whipping cream recipe becomes simpler to follow any time. 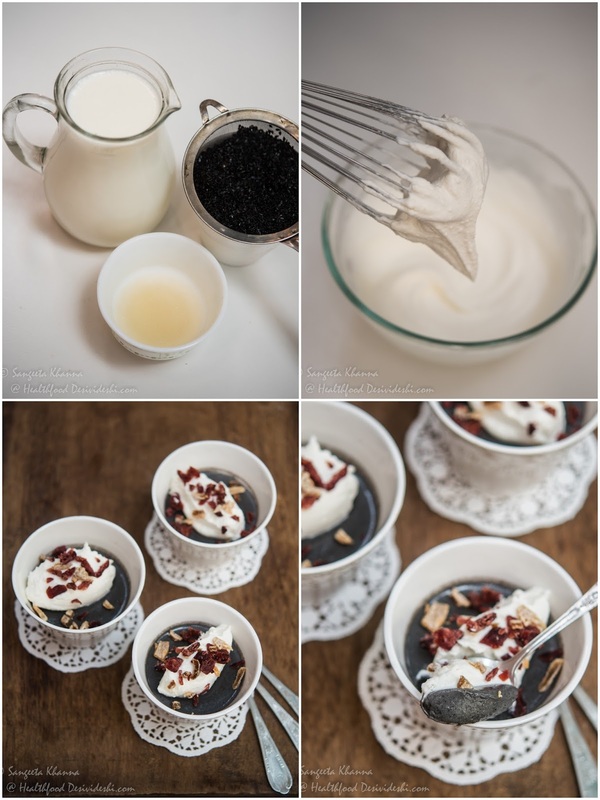 For 2 Liters of Premium milk from Mother Dairy (7% fat) you get enough whipping cream to frost a cake or to top 6-8 portions of this black sesame pudding. Soak the gelatin in 1 tbsp water. Keep aside. Rinse the black sesame seeds and drain. Make a paste in blender adding 5 ml milk at a time, helping it make a smooth creamy paste. Transfer this paste into a pan along with the milk and sugar. Heat till it boils. Take the pan off heat and add the bloomed gelatin. Whisk well to mix. Pour into serving bowls or glasses. Chill for 2 hours before serving. The pudding keeps well in the fridge for 2-3 days. Top with a quenelle or smooth blob of whipped cream on top. 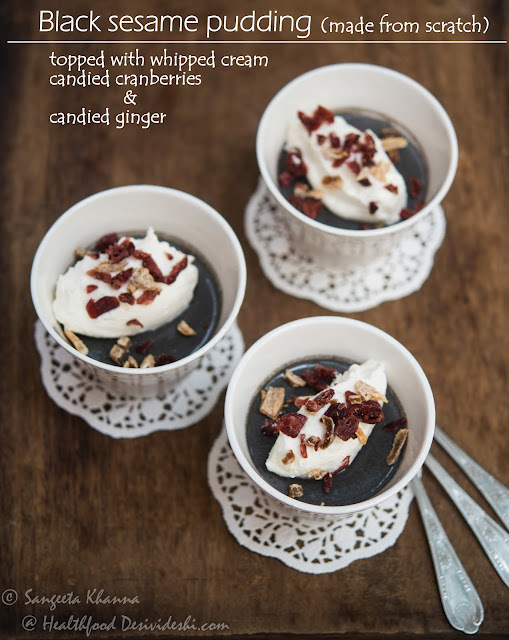 Sprinkle generously with chopped candied cranberries and candied ginger. It is a soft set pudding that jiggles when you scoop with a spoon. 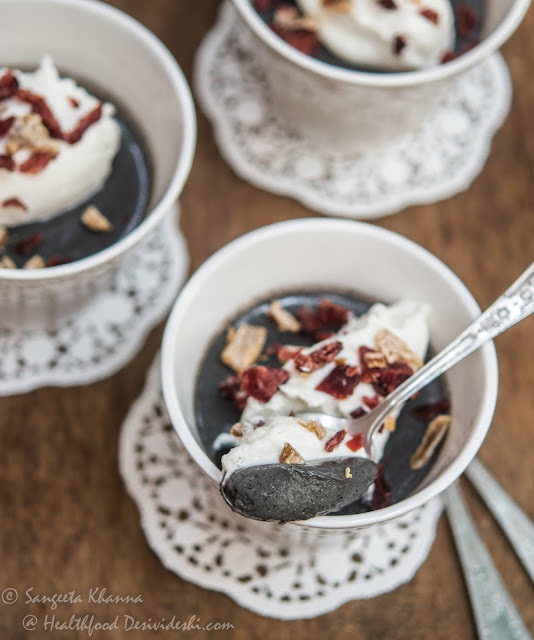 Keep some extra whipped cream and cranberry ginger topping on the table so one can go bonkers with black sesame pudding. This black sesame pudding is smooth textured and nutty in flavor with a slight bitter aftertaste that actually works in its favour. The candied tidbits add great texture to the black sesame pudding and act as little bombs of flavour that explode in between. Now that we have mastered the whipping cream and heavy cream, why not make some white butter too. After all the same malai is used a little differently to make cultured white butter that we have loved since our childhood. 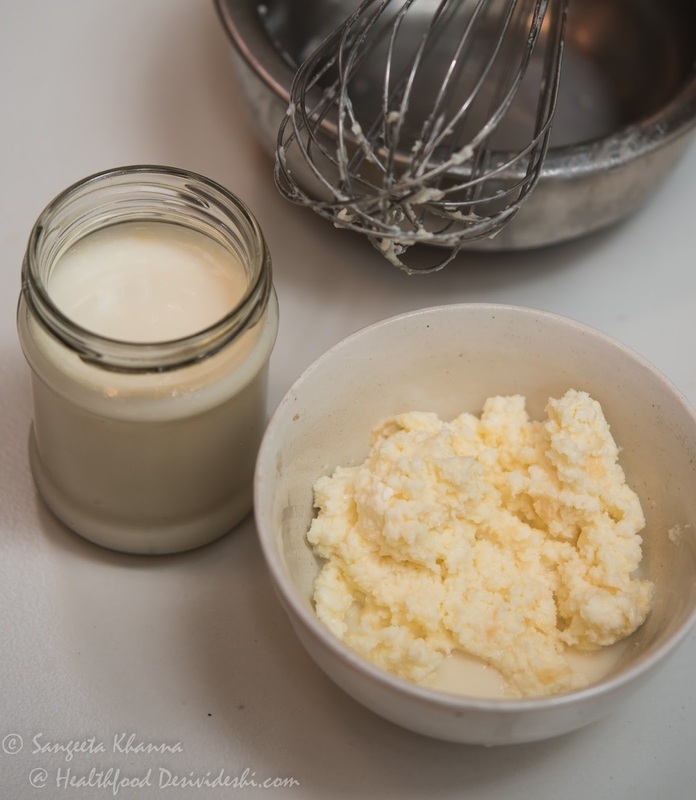 Here is how you can make the cultured white butter from scratch. 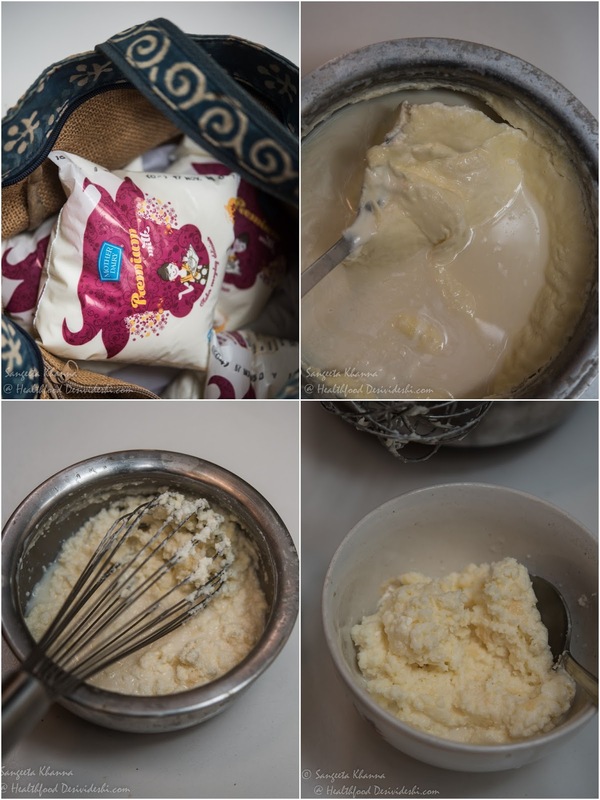 Starting from step 3 of the heavy cream procedure, collect the malai from top of the chilled milk, mix with active yogurt culture and let it set overnight at the kitchen counter, at room temperature. In summers it takes only a couple of hours, but you need to chill it again before making white butter. 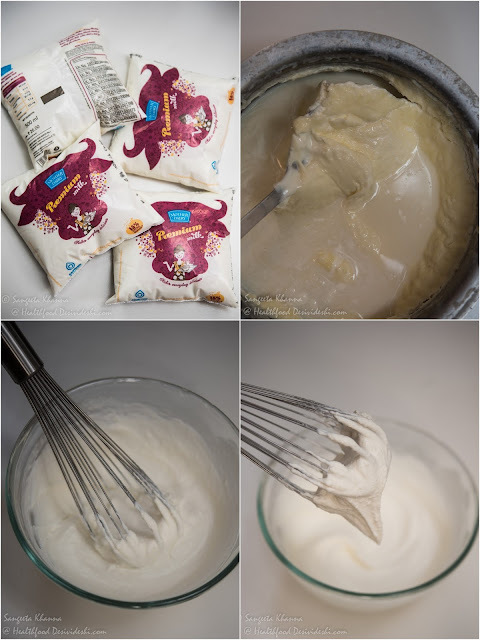 In winters you can whip the cultured cream (sour cream) with a wire whisk directly for 3-4 minutes (for cultured cream from 2 L milk) and get white butter instantly when needed. 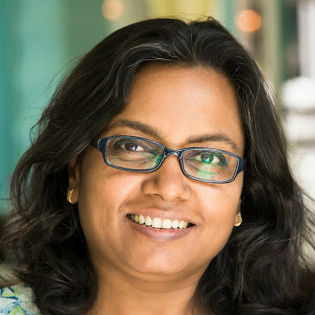 Of course Mother Dairy Premium milk yields more white butter for the same effort. You get some cultured buttermilk as a byproduct when you collect the white butter from top. Collect the white butter in another bowl and press it down to separate all the buttermilk from it. This buttermilk is so delicious you might want to make white butter for the sake of this flavourful buttermilk too. Use this white butter to top your parathas, soups or dals or for baking cakes and cookies.